Unfortunately the name of the gentleman in this photograph is currently unknown - maybe you can help? If so leave a comment. The robes worn by this gentleman may indicate that he is in the clergy. The album that this photograph belongs to was once owned by Georgina Muir. In this particular branch of the Aulds, both the Muir and Auld names have strong links to the Presbyterian church. Georgina Muir married Reverend John Auld and their son John Hay Goodlet Auld also became a Reverend in the Presbyterian church. One possibility is the Reverend James Stirling Muir. Rev. John Calder has written an article on One Hundred Years of Presbyterianism on the North Shore, 1844-1944: St Peter's Presbyterian Church, North Sydney in which there is mention of Reverend Muir in Sydney during the early 1870s. Inducted into the pastoral charge of St. Peter's Church, North Shore (Sydney), in 1870, Rev. James Stirling Muir continued until 1871 at which time he left the colony. 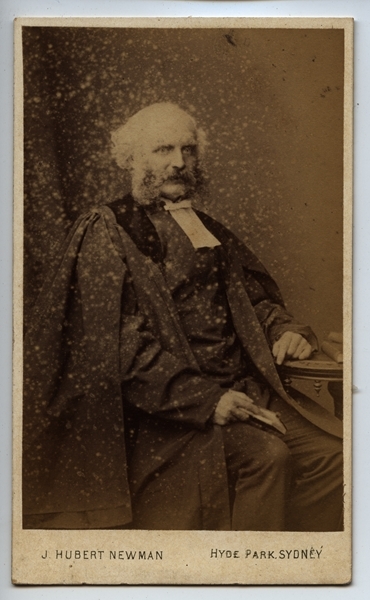 James Stirling Muir's father Rev. John Muir, was also a minister in the Presbyterian church. To date a connection has not been found between the Rev. James Stirling Muir and Georgina Muir. 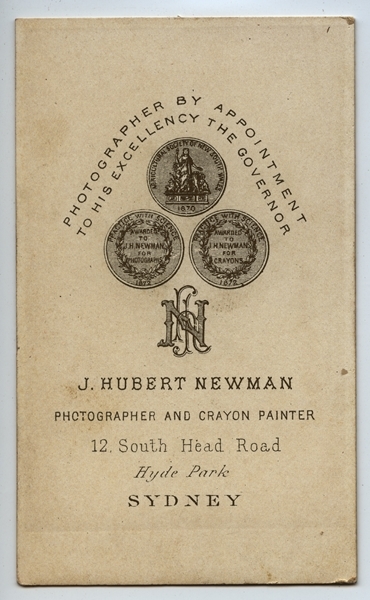 Imprint on the front face is small text and reads "J. HUBERT NEWMAN HYDE PARK, SYDNEY"
See Trove Tuesday : John Hubert Newman [Photographer] for more information on John Hubert Newman and his photographic studio at 12 South Head Road. As discussed in that post, the documentary evidence based solely on the information provided on the back imprint dates the photo to 1872-1874, or 1873 ±1 year.